Mac Demarco - This Old Dog. Vinyl LP, CD. Bleep. Indie’s cheeky chappy comes through with his first full-length since 2014 LP Salad Days sent his popularity stratospheric. There’s nothing here to shock the seasoned Demarco-er - the thirteen songs on This Old Dog are classic Mac. Bar a polish on the production that befits his elevated status in the rock pantheon, many of the tracks here could easily have slotted into Salad Days, characterised as they are by perky chord progressions and languid grooves. 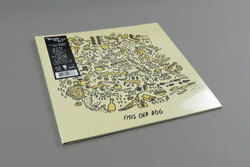 Old-timey rock ‘n roll, doo-wop and bedroom pop are obvious touchstones along with a cornucopia of indie luminaries, but at its core This Old Dog is simply a collection of wistful, heartfelt songs that would do well in any era.